The Tony award-winning musical Jersey Boys is what is called a jukebox musical* - a musical that's constructed around already existing popular songs and doesn't feature new music written expressly for the stage. 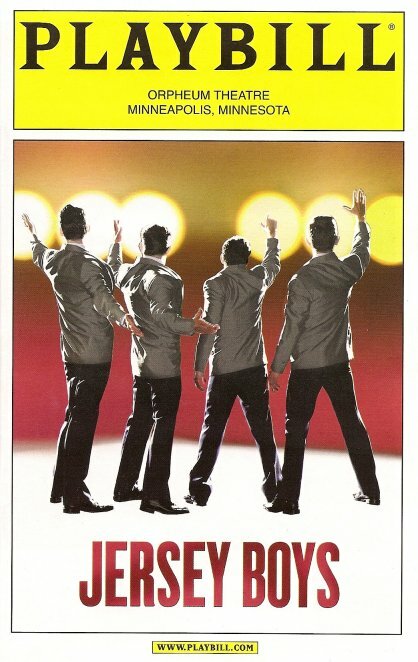 But unlike most jukebox musicals which feature a fictional story created to fit into and around the songs, often resulting in a convoluted or predictable story (e.g., Mamma Mia, Rock of Ages), Jersey Boys chronicles the true story of the 1960s American rock and roll band the Four Seasons. Instead of forcing the story to fit the songs, the story takes center stage while the songs illustrate where the boys are in their career. The book (by Marshall Brickman and Rick Elice) is really well constructed and clever. Each member of the original Four Seasons takes a turn narrating the show, giving their unique perspective on the rise and fall of the band, and how the constant touring and heightened fame took a tole on their personal lives. As one of the boys says, "you sell 100 million records, see how you handle it." The early life of the Four Seasons is told by Tommy DeVito, who (in his view) was responsible for getting the group together and managing the gigs and tours. And he never lets the other guys forget it, which causes some tension as the years go on. He's a smooth and cool charmer, and a bit of a bad boy (women, gambling, etc.). Matt Bailey as Tommy has great charisma and a strong stage presence; I had a hard time taking my eyes off of him when he was on stage, no matter what else was going on. When Tommy left the band in the second act and Matt left the stage, I felt his absence and anxiously awaited his return. The next chapter of the story is told by Bob Gaudio, the young songwriter whose addition to the group spurred their early success, penning such hits as "Sherry," "Big Girls Don't Cry," and "Walk Like A Man." The night I saw the show there was an understudy in the role. I usually don't mind seeing an understudy (unless I know the usual actor), in fact it's sometimes fun to see an understudy give an all-out performance in one of their few opportunities to play the role. Kevin Worley gave that kind of a performance; it felt like he had been out there every night with the other guys. He sings my favorite song in the show, "Cry for Me," which is the first Four Seasons hit featured in the show; it's a show-stopper and a preview of what's to come. In the second act, Nick Massi, the bassist and arranger, takes over the narration. Nick is played by Steve Gouveia, who's been with the show since its pre-Broadway run in San Diego, which is evident in his comfort with the role. Things start to go wrong with the group as the tensions build and the fame and expectations increase. Tommy is forced to leave the group after his huge gambling debts are found out, and Nick chooses to walk away. The final chapter is told by the most well-know member of the group, Frankie Valli, the man with the golden falsetto. I saw an understudy in this role too; John Michael Dias is scheduled for a couple performances a week. I imagine singing this show eight times a week is rough on the voice, so they have a regular understudy. Again, he was great, growing from the naive 16-year-old kid whom Tommy takes under his wing, to the seasoned performer who keeps the group going when everyone else has left (in fact Frankie Valli is still touring today). The show ends with the group's induction into the Rock and Roll Hall of Fame in 1990, and the band is happily reunited for a final song ("Who Loves You") and a short postscript from each of the boys about what they're doing now. As I mentioned earlier, the reason this show is successful (I mean that in artistic terms, since the songs alone would probably make it a commercial success, as countless jukebox musicals have proven*), is because of the way the show is constructed, including book, direction, and sets. Singing under the streetlight effortlessly transforms into singing in the studio or a club. One of my favorite devices is when the Four Seasons appear on the TV shows Ed Sullivan and American Bandstand. You see the guys from the side, performing to the cameras, while on the screen behind them you see what it looks like on TV (I wonder how many versions of this they had to film with the various combinations of understudies). Then they turn to face the audience like they're performing at a concert, and we the Jersey Boys audience play the role of the audience at a Four Seasons concert. The screens also at times showcase fun 60s-era cartoons which add to the period feeling of the show, not to mention the fabulous Mad Men-esque wardrobe! This is my second time seeing the show on tour, and I've been listening to and loving the soundtrack for the last three years ago. The music is infectious, the cast is great (four strong leads plus a talented ensemble playing a huge number of roles), the well-told story is dramatic and funny and interesting. And there's just something appealing about watching four men in matching well-tailored suits, singing great songs and performing smart choreography. 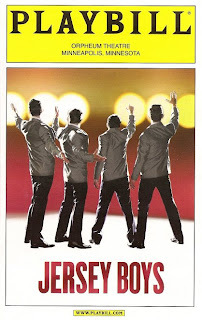 Jersey Boys is playing through May 8 at the Orpheum Theatre; there might be a few seats left if you hurry. Continue reading if you're interested in a philosophical discussion of the state of musical theater today. If not, thanks for reading this far! *Last week I attended a "Broadway Confidential" talk (sponsored by Hennepin Theatre Trust) about the rise of the jukebox musical. While I didn't enjoy it as much as the previous talk about HAIR! (I may be slightly biased because that's one of my favorite musicals and I find the historical and political implications fascinating), it was an interesting discussion. Lori Maxwell, a local music director and director, talked about all the wonderful reasons that the jukebox musical is so successful (less risky, built in audience, makes a lot of money, etc.). I tend to think of those reasons as negatives; to me they sound like consumerism, not art. In some ways I think jukebox musicals are a cop-out - an easy way for Broadway producers to ensure a return on their investment and not take a risk on something new and innovative, which may or may not succeed. These days most original musicals (Spring Awakening, Next to Normal (coming soon to the Ordway, go see it! ), Scottsboro Boys, Bloody Bloody Andrew Jackson) have to show a success Off-Broadway before producers will take a chance on them on a Broadway stage. While something featuring the music of the Shirelles (Baby It's You) or pop hits (Priscilla Queen of the Desert) is guaranteed to sell tickets to people looking for nostalgia. I think the audience has to take some responsibility too; both Scottsboro Boys and Bloody Bloody Andrew Jackson ended their runs early last year, partly because of lack of ticket sales. Whether on network TV or Broadway, producers are no longer willing to let an audience build slowly, insisting on instant success or pulling the plug. There's plenty of new, original, innovative musical theater around (just in the last month I've seen two brilliantly inventive original musical pieces right here in Minnesota: The Age of Wordsworth and Heaven - which I think could and should play on Broadway), it's just that less and less of it can be seen on Broadway. Jersey Boys is the exception that proves the rule - a jukebox musical that feels authentic and original, despite not featuring any original music. I believe in the art form that is musical theater; there are no limits to the stories it can tell and the things it can do. That's why I try to support original musical theater wherever I can find it!